It is well-known that the increased demands on reduced emission levels, as TIER 4F and EPA 2013, have led to higher fuel pressures and increased temperatures in the engine compartment. In combination with the time-critical industry demands, the risk for fires to start in the engine compartment has risen dramatically. Statistics show that nearly 55% of all fires in mines originate in a vehicle fire*. This has been a rising figure over many years. Out of these, hot surfaces is the dominating cause, and also overheating lead to several fires. Together, these two are the cause of more than 50% of all vehicle fires in mines. An engine fire above or underground can be devastating, as every minute of operation counts. Due to the typically large quantities of diesel and hydraulic oil, often operating under high pressures in the immediate area, an ignited engine fire could lead to a rapid and disastrous series of events. The end result in form of financial and operational consequences, in the event that started with e.g. 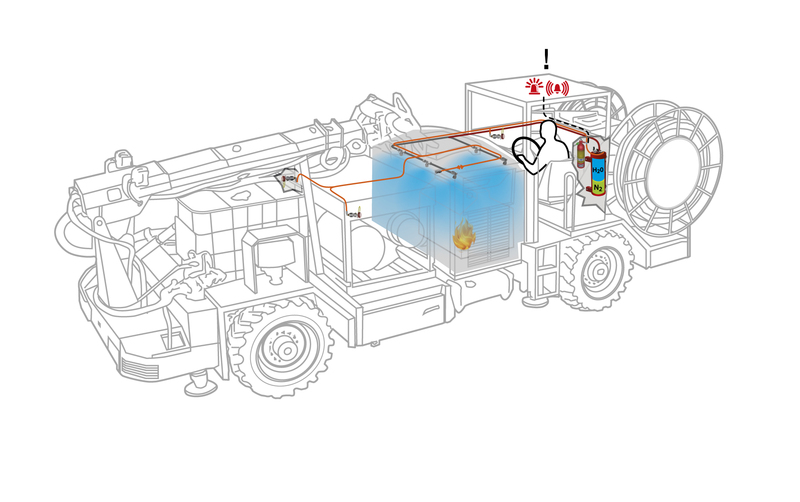 a leaking fuel line or ruptured hydraulic hose, all machine operators want to prevent. Still the most important resource of any company is the human workforce, whom is also put at great danger, in the event of a fire. We have a long experiance of installations in underground machines. Contact us for more information.